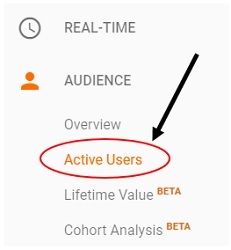 Google Analytics uses a metric called active users which refers to real time users, when used in the context of real time reports. 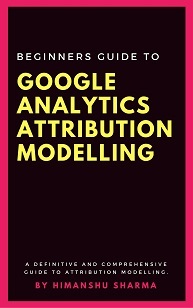 When the active users metric is used in the context of the ‘Active users’ report in Google Analytics, it refers to the number of users who visited your website within the last 1 to 30 days in the selected time period. 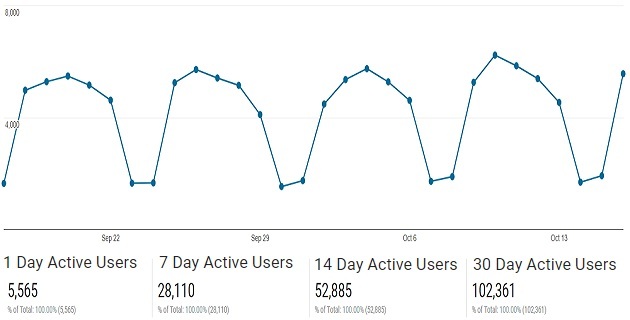 Through ‘Active users’ report you can determine the number of users who visited your website in the last 1, 7, 14 or 30 days in the selected time period. 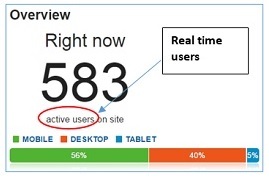 Users who visited your website in the last 1 day, in the selected time period are known as 1 day active users. Users who visited your website in the last 7 days, in the selected time period are known as 7 day active users. Users who visited your website in the last 1 day, in the selected time period are known as 14 day active users. Similarly, Users who visited your website in the last 30 days, in the selected time period are known as 30 days active users. Note(1): The name active users is a bit misleading in the context of the active users report, as here active users do not mean real time users. Note(2): Both users and active users are the same thing in the context of the active users report. Step 1: Plot 7, 14 or 30 days active users on the active users report. To plot a metric, simply select it. Note: The 1 day active users metric is plotted by default. Your website, mobile app or offering is not doing a good job of engaging the qualified traffic. So the traffic is not sticking around. This is the kind of insight you can get from the active users report.